OBJECTIVE To provide family physicians and pharmacists with practical, evidence- and expertise-based guidance on choosing the safest approach to using analgesics to manage patients with musculoskeletal pain. SOURCES OF INFORMATION Health care providers from family practice, rheumatology, gastroenterology, hepatology, internal medicine, and pharmacy participated in an educational needs assessment regarding the management of pain and the safety of commonly used analgesics. Feedback from one-on-one interviews was compiled and distributed to participants who selected key topics. Topics chosen formed the basis for the discussions of this multidisciplinary panel that reviewed data on the safety of analgesics, particularly in regard to comorbidity and concurrent use with other therapies. MAIN MESSAGE Treatment should begin with an effective analgesic with the best safety profile at the lowest dose and escalate to higher doses and different analgesics as required. Acetaminophen is a safe medication that should be considered first-line therapy. Nonsteroidal anti-inflammatory drugs (NSAIDs) are associated with potential adverse gastrointestinal, renal, hepatic, and cardiovascular effects. Physicians should not prescribe NSAIDs before taking a careful history and doing a physical examination so they have the information they need to weigh the risks (adverse effects and potential drug interactions) and benefits for individual patients. CONCLUSION Taking a complete and accurate history and doing a physical examination are essential for choosing the safest analgesic for a particular patient. Pain is among the most common reasons for visits to primary care physicians,1,2 and the proportion of Canadians seeking treatment for pain is expected to rise as the population ages and people develop chronic conditions, such as osteoarthritis. Each year in Canada, more than 19 million prescriptions are written for analgesics,3 and 4.5 billion nonprescription doses of pain medication4 are purchased. Mrs R.N., who is 66 years old, comes to you for treatment of pain related to osteoarthritis in her knees and hips. Her history includes myocardial infarction at age 58, controlled hypertension, and occasional heartburn. Current medications include hydrochlorothiazide, ramipril, atenolol, and low-dose acetylsalicyclic acid. How would you manage her pain? Cyclooxygenase-2 selective NSAIDs (COX-2 inhibitors, or coxibs) were introduced as safer than traditional NSAIDs based on their better GI safety profile, but were subsequently found to be associated with an increase in cardiovascular (CV) adverse events.8,9 The withdrawal of rofecoxib and valdecoxib and the discovery that most, if not all, traditional NSAIDs carry a risk of CV adverse events10 has left physicians questioning how best to manage pain. Prescribing appropriate analgesics is complicated by concomitant treatments and underlying conditions. Clopidogrel, an important antithrombotic agent, is commonly used with ASA for patients at high risk of CV events,14 but combination therapy carries a heightened risk of GI bleeding.14 Selective serotonin reuptake inhibitors might also cause GI bleeding, and risk increases with concomitant ASA or NSAID use.15 Common comorbidity, such as CV disease, diabetes, and GI problems, further complicate appropriate management. Because of the prominence of pain-related conditions, the complexities of their clinical management, and the changing therapeutic landscape, a panel was convened to explore the issues surrounding management of pain. The aim was to provide practical, evidence- and expertise-based guidance for family physicians and pharmacists because they are frequently asked for advice on nonprescription medications and should be prepared to give appropriate answers. Given the hypothesis that health care providers could be confused regarding the safety of commonly used analgesics given the known risks of traditional NSAIDs, new concerns over the CV safety of COX-2 inhibitors and traditional NSAIDs, and the added complexity of commonly encountered comorbidity and adjunct therapies, we set out to clarify the issues. A third-party consultant and the Chair of this multidisciplinary panel (R.H.H.) conducted 1-on-1 interviews with family physicians, a gastroenterologist, a hepatologist, an internist, a rheumatologist, and a pharmacist to solicit unprompted feedback on the particular issues that each felt to be important. This feedback was summarized into a comprehensive list that was distributed to all panel members who were then asked to select the topics they thought were most important. These topics then formed the basis for discussion during a day-and-a-half meeting of the panel in January 2006. During the meeting, each specialist summarized data on the safety of pain medication in use in his or her area. Their summaries were based on key references and, where available, meta-analyses. Following each review of data in a particular therapeutic area (rheumatology, gastroenterology, hepatology, and internal medicine and cardiology), a family physician presented 1 or more cases that illustrated the challenges of choosing an analgesic in light of patients’ conditions and concomitant medications. The entire process of conducting the needs assessment, summarizing feedback, and organizing the meeting was facilitated by the consultant with direction from R.H.H. and was supported by an unrestricted educational grant from McNeil Consumer Healthcare. This article outlines the main messages from the meeting and lists important, more recent references in lieu of a full systematic review. Pain-related conditions that most frequently result in primary care visits include back pain (17.63 cases/1000 visits), headaches (16.10/1000), knee pain (8.51/1000), low back pain (8.42/1000), shoulder pain (6.97/1000), and neck pain (6.50/1000).1 Complaints can be divided into acute pain, which implies a shorter, discrete treatment period with potentially reduced risk of adverse events from analgesics, and chronic pain (Table 1). The nature of the pain is an important determinant of the approach to treatment and of prognosis, and even in the absence of an identifiable cause, pain must still be managed effectively. We review the safety of various analgesics with a particular focus on treatment of musculoskeletal pain. In moderate-to-heavy drinkers, liver damage from therapeutic doses of acetaminophen (alcohol-acetaminophen syndrome) has been reported.21 Critical evaluation of these reports suggests that overdoses rather than therapeutic doses of acetaminophen were more commonly involved.16 Prospective, controlled short-term studies have not found hepatic damage in alcoholics administered therapeutic doses of acetaminophen.22 Similar findings in long-term trials would provide reassuring evidence of the safety of acetaminophen for moderate-to-heavy drinkers. Both types of NSAIDs are widely used as analgesics. In the United States, about 70% of people 65 years old or older take NSAIDs weekly and about 50% take them daily.23 Unfortunately, NSAIDs are associated with potential adverse effects on the liver, kidneys, and most notably, the GI tract. Creatinine clearance should be evaluated at the start of NSAID therapy and shortly thereafter in patients at risk of renal problems (level II evidence).44,46 It is wise to be cautious if creatinine clearance is 30 to 60 mL/min; NSAID therapy should be avoided if clearance is <30 mL/min (level III evidence). Low-dose ASA is commonly prescribed for cardioprotection rather than for analgesia. Atherosclerotic disease is a major cause of death; coronary artery disease is responsible for 1 in 5 deaths and stroke for 1 in 14 deaths.48 Peripheral arterial disease, which affects 12% to 20% of Americans, is associated with a 4- to 5-fold increased risk of dying from CV disease.48 Taking ASA puts patients at risk of GI complications and dyspepsia, similar to the complications and dyspepsia associated with NSAIDs, even in its enteric-coated or buffered form.49 Even the lower doses (75 to 325 mg) commonly taken for cardioprotection put patients at risk of ulcers and GI bleeding12,50; higher doses further increase the risk of bleeding without increasing cardioprotection.51 Therefore, low-dose ASA should be used for cardioprotection and reserved for patients with established CV risk (secondary prevention) (level I evidence). Many patients are reluctant to admit that they use alternative medicines, and these medicines might have adverse effects or interact with other medications. Physicians need to encourage patients to mention their use of alternative approaches and to reassure them that disclosure will not incur disapproval. Knowledge of patients provides an important context for understanding their pain and tolerance levels. Physicians who know patients well can tailor medications and messages to individual patients, although physicians in emergency departments or walk-in clinics are not able to do this. Patients’ concerns, for example, that pain indicates life-threatening or serious conditions, are important to recognize and address. Reassurance can be helpful, as can specialist consultation and testing, if appropriate. Given patients’ confusion about nonprescription pain medications,30 physicians and pharmacists should alert patients to maximum daily analgesic doses and the potential for overmedicating with multiple products. Patients should be advised that, if pain is not adequately controlled on the recommended treatment, they should return to their physicians or clinics rather than take additional nonprescription products that might increase their risk of adverse events. Patients might be reluctant to take a particular drug but be willing to consider an alternative. Awareness of patients’ preferences can prevent their returning with symptoms without having filled their prescriptions. Physicians should explain what the prescribed drug is for, the benefits and risks of therapy, the length of treatment, and when to return for re-assessment. Following the guideline of “safest analgesic, lowest dose,” Mrs R.N. was started on 1000 mg of acetaminophen twice daily. When little relief was noted after 24 hours, her dose was increased to 1000 mg 4 times daily, which was moderately effective. She received steroid injections in an effort to treat locally and to avoid NSAID use given her hypertension, GI symptoms, and advanced age. This case and discussion highlight the challenges of choosing appropriate analgesic treatment in light of the evolving literature on the safety of NSAIDs and the complexity of comorbidity and cotherapies. Acetaminophen is a safe, well tolerated, and appropriate first-line treatment for managing pain. Treatment with NSAIDs should be initiated only after a full evaluation of risks and anticipated benefits. Important points to consider in selecting an analgesic are outlined in Table 2. Many questions remain regarding the safety of analgesics, including the GI and CV risk posed by various NSAIDs, the safety of topical NSAIDs, and the future of COX-2 inhibitors based on emerging safety data and the newest COX-2 drugs. We encourage readers to watch the literature for developments in these areas. This project was supported through an unrestricted educational grant from McNeil Consumer Healthcare Canada. Musculoskeletal pain can be difficult to manage, particularly in patients with comorbidity. Treatment should begin with the safest analgesic (generally acetaminophen) at the lowest dose. Use of multiple nonsteroidal anti-inflammatory drugs should be avoided. Low-dose acetylsalicylic acid counts as a nonsteroidal anti-inflammatory drug. Many treatment modalities might be required to achieve appropriate pain control. It is preferable to treat locally (eg, local steroid injection) rather than systemically, where feasible. La douleur musculo-squelettique peut être difficile à traiter, surtout en présence de comorbidité. On devrait commencer par l’analgésique le plus sécuritaire (habituellement l’acétaminophène) à la dose la plus faible. On devrait éviter d’utiliser plusieurs anti-inflammatoires non stéroïdiens (AINS). L’acide acétylsalicylique à faible dose équivaut à un AINS. On doit parfois recourir à plusieurs modalités de traitement pour bien contrôler la douleur. Un traitement local (par ex., une infiltration stéroïdienne) est préférable à un traitement systémique. Dr Hunt has acted as consultant, investigator, or speaker for the following companies: Allergan, Altana Pharma, AstraZeneca, Axcan Pharma, Merck Frosst, NEGMA Laboratories, Novartis Pharmaceuticals, Tap Pharmaceuticals, and Santarus. He is Chief Executive Officer of Strategic Consultants International. ; Jones R, Britten N, Culpepper L, Gass D, Grol R, Mant D, et al., editors. Oxford textbook of primary medical care. London, Engl: Oxford University Press; 2003. The nature of primary medical care; p. 3-10.
. Pain as a reason to visit the doctor: a study in Finnish primary health care. Pain 2001;89:175-80. IMS Health Canada. Canadian disease and therapeutic index, March 2005. Norwalk, Conn: IMS Health; 2006. A.C. Nielsen MarketTrack. National drug+GB+MM, latest 52 weeks ending March 31, 2006. Markham, Ont: A.C. Nielsen Canada; 2006.
. Meta-analysis of dyspepsia and nonsteroidal anti-inflammatory drugs. Arthritis Rheum 2003;49:508-18.
. A meta-analysis of severe upper gastrointestinal complications of nonsteroidal anti-inflammatory drugs. J Rheumatol 2002;29:804-12.
. Quantitative estimation of rare adverse events which follow a biological progression: a new model applied to chronic NSAID use. Pain 2000;85:169-82.
. Cardiovascular events associated with rofecoxib in a colorectal adenoma chemoprevention trial. N Engl J Med 2005;352:1092-102.
. Cardiovascular risk associated with celecoxib in a clinical trial for colorectal adenoma prevention. N Engl J Med 2005;352:1071-80.
. Do selective cyclo-oxygenase-2 inhibitors and traditional non-steroidal anti-inflammatory drugs increase the risk of atherothrombosis? Meta-analysis of randomised trials. BMJ 2006;332:1302-8.
. ACC/AHA guideline update for the management of patients with unstable angina and non–ST-segment elevation myocardial infarction—2002: summary article: a report of the American College of Cardiology/American Heart Association Task Force on Practice Guidelines (Committee on the Management of Patients With Unstable Angina). Circulation 2002;106(14):1893-900.
. Association between aspirin and upper gastrointestinal complications: systematic review of epidemiologic studies. Br J Clin Pharmacol 2001;52:563-71.
. Aspirin for the primary prevention of cardiovascular events: a summary of the evidence for the U.S. Preventative Services Task Force. Ann Intern Med 2002;136(2):161-72.
. Use of selective serotonin reuptake inhibitors and risk of upper gastrointestinal tract bleeding: a population-based cohort study. Arch Intern Med 2003;163:59-64.
. Tolerability of paracetamol. Drug Saf 2005;28:227-40. McNeil Consumer Healthcare; Repchinsky C, editor. Compendium of pharmaceuticals and specialties. The Canadian drug reference for health professionals. Ottawa, Ont: Canadian Pharmacists Association; 2006. Tylenol; p. 2290-2.
. The therapeutic use of acetaminophen in patients with liver disease. Am J Ther 2005;12:133-41.
. Acetaminophen-induced acute liver failure: results of a United States multi-center, prospective study. Hepatology 2005;42(6):1364-72.
. Knowledge about acetaminophen toxicity among emergency department visitors. Vet Hum Toxicol 2002;44:370-3.
. Alcohol-acetaminophen syndrome. Even moderate social drinkers are at risk. Postgrad Med 2000;107:189-95.
. Effect of maximal daily doses of acetaminophen on the liver of alcoholic patients. Arch Intern Med 2001;161:2247-52.
. Approaches to nonsteroidal anti-inflammatory drug use in the high-risk patient. Gastroenterology 2001;120:594-606.
. Dyspepsia tolerability from the patients’ perspective: a comparison of celecoxib with diclofenac. Aliment Pharmacol Ther 2002;16:819-27.
. Epidemiology overview of gastrointestinal and renal toxicity of NSAIDs. Int J Clin Pract Suppl 2003;135:43-9.
. Over the counter non-steroidal anti-inflammatory drugs and risk of gastrointestinal bleeding. J Epidemiol Biostat 2000;5:137-42.
. Interactions between Helicobacter pylori and other risk factors for peptic ulcer bleeding. Aliment Pharmacol Ther 2002;16:497-506.
. Endoscopic evaluation of the effect of indomethacin capsules and suppositories on the gastric mucosa in rheumatic patients. J Rheumatol 1984;11(4):484-7.
. An evidence-based evaluation of the gastrointestinal safety of coxibs. Am J Cardiol 2002;89(6A):3-9D.
. The effectiveness of five strategies for the prevention of gastrointestinal toxicity induced by non-steroidal anti-inflammatory drugs: systematic review. BMJ. Vol. 329. 2004 [Accessed 2007 April 27]. p. 948. Epub. Available from: http://www.bmj.com/cgi/content/full/329/7472/948.
. Risk for serious gastrointestinal complications related to use of nonsteroidal anti-inflammatory drugs. A meta-analysis. Ann Intern Med 1991;115:787-96.
. Risk of upper gastrointestinal bleeding and perforation associated with individual non-steroidal anti-inflammatory drugs. Lancet 1994;343:769-72.
. Misoprostol reduces serious gastrointestinal complications in patients with rheumatoid arthritis receiving nonsteroidal anti-inflammatory drugs. A randomized, double-blind, placebo-controlled trial. Ann Intern Med 1995;123:241-9.
. Visible small-intestinal mucosal injury in chronic NSAID users. Clin Gastroenterol Hepatol 2005;3:55-9.
. Role of Helicobacter pylori infection and non-steroidal anti-inflammatory drugs in pepticulcer disease: a meta-analysis. Lancet 2002;359:14-22.
. Hepatotoxicity associated with non-steroidal anti-inflammatory drugs. Clin Liver Dis 2003;7:401-13.
. Hepatocellular damage from non-steroidal anti-inflammatory drugs. Q J Med 2003;96:787-91.
. Diclofenac-induced liver injury: a paradigm of idiosyncratic drug toxicity. Toxicol Appl Pharmacol 2003;192:307-22.
. The hepatotoxicity of non-steroidal anti-inflammatory drugs. Aliment Pharmacol Ther 2004;20:373-80.
. Diclofenac-associated hepatotoxicity: analysis of 180 cases reported to the Food and Drug Administration as adverse reactions. Hepatology 1995;22:820-7.
. The hepatic safety and tolerability of the novel cyclooxygenase-2 inhibitor celecoxib. Am J Ther 2000;7:153-8.
. Gastrointestinal toxicity with celecoxib vs nonsteroidal anti-inflammatory drugs for osteoarthritis and rheumatoid arthritis. The CLASS Study: a randomized controlled trial. JAMA 2000;284:1247-55.
. Ibuprofen-induced hepatotoxicity in patients with chronic hepatitis C: a case series. Am J Gastroenterol 1998;93:1563-5.
. Nonsteroidal anti-inflammatory drugs. Proposed guidelines for monitoring toxicity. West J Med 1991;155:39-42.
. Drug administration in chronic liver disease. Drug Saf 1997;17:47-73.
; Third Canadian Consensus Conference Group. An evidence-based approach to prescribing nonsteroidal antiinflammatory drugs. Third Canadian Consensus Conference. 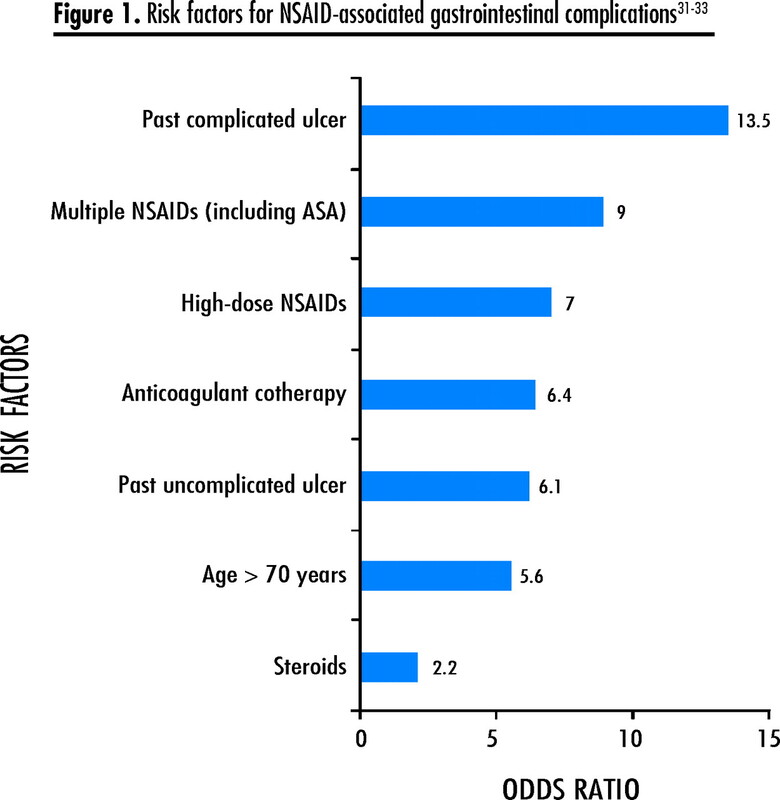 J Rheumatol 2006;33(1):140-57.
. Risk of hospitalization for myocardial infarction among users of rofecoxib, celecoxib, and other NSAIDs: a population-based case-control study. Arch Intern Med 2005;165:978-84. American Heart Association. Heart disease and stroke statistics—2006 update. Dallas, Tex: American Heart Association; 2007 [Accessed 2006 March 11]. Available from: http://www.americanheart.org/downloadable/heart/113535864858055-1026_HS_Stats06book.pdf.
. Risk of aspirin-associated major upper-gastrointestinal bleeding with enteric-coated or buffered product. Lancet 1996;348:1413-6.
. Prevalence and incidence of gastroduodenal ulcers during treatment with vascular protective doses of aspirin. Aliment Pharmacol Ther 2005;22:795-801. Antithrombotic Trialists’ Collaboration. Collaborative meta-analysis of randomized trials of anti-platelet therapy for prevention of death, myocardial infarction, and stroke in high risk patients. BMJ 2002;324:71-86.
. Corticosteroids in rheumatic disease. Understanding their effects is key to their use. Postgrad Med 1998;103:137-42.
. Safety and efficacy of long-term intra-articular steroid injections in osteoarthritis of the knee: a randomized, double-blind, placebo-controlled trial. Arthritis Rheum 2003;48:370-7.
. Use of opioid analgesics for the treatment of chronic noncancer pain. A consensus statement and guidelines from the Canadian Pain Society, 2002. Pain Res Manage 2003;8(Suppl A):3-14A.
. Opioids in chronic non-cancer pain, indications and controversies. Eur J Pain 2005;9:127-30.
. Amitriptyline. A review of its pharmacological properties and therapeutic use in chronic pain states. Drugs Aging 1996;8:459-76.
. A guide to the understanding and use of tricyclic antidepres-sants in the overall management of fibromyalgia and other chronic pain syndromes. Arch Intern Med 1996;156:1047-52.
. Hypnosis for pain relief in labour and childbirth: a systematic review. Br J Anaesth 2004;93:505-11.
. The effectiveness of adjunctive hypnosis with surgical patients: a meta-analysis. Anesth Analg 2002;94:1639-45. Sanofi-Synthelabo, Bristol-Myers Squibb; Repchinsky C, editor. Compendium of pharmaceuticals and specialties. The Canadian drug reference for health professionals. Ottawa, Ont: Canadian Pharmacists Association; 2006. Plavix; p. 1680-3.
. Efficacy, tolerability, and upper gastrointestinal safety of celecoxib for treatment of osteoarthritis and rheumatoid arthritis: systematic review of randomised controlled trials. BMJ 2002;325:619-26.
. Tolerability and adverse events in clinical trials of celecoxib in osteoarthritis and rheumatoid arthritis: systematic review and meta-analysis of information from company clinical trial reports. Arthritis Res Ther. Vol. 7. 2005 [Accessed 2007 April 27]. p. R644-65. Epub 2005 Mar 24. Available from: http://arthritis-research.com/content/7/3/R644.
. Celecoxib versus naproxen and diclofenac in osteoarthritis patients: SUCCESS-I Study. Am J Med 2006;119:255-66.
. Cyclo-oxygenase inhibitors and the antiplatelet effects of aspirin. N Engl J Med 2001;345:1809-17.
. Inhibition of clinical benefits of aspirin on first myocardial infarction by non-steroidal antiinflammatory drugs. Circulation 2003;108:1191-5.
. NSAID-related adverse drug interactions with clinical relevance. An update. Int J Clin Pharmacol Ther 1994;32:509-32.